The facility currently employs four ORTEC® HPGe GWL series coaxial well-type gamma detectors, each housed in a 100mm thick lead shield. Resulting spectra may be analysed for different environmental radioisotopes including 210Pb, 226Ra, 137Cs, 134Cs, 241Am, 7Be and 40K. The facility was established in 2003 since when the main application has been for the radiometric dating of lake sediments and peats via the measurement of 210Pb, 137Cs and 241Am. This enables chronologies of 100 - 150 years to be accurately determined. 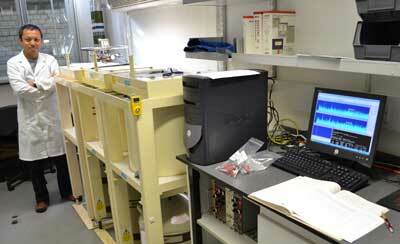 The facility has undertaken these analyses for research projects based in many areas of the world. Radiometric dating of lake, marine and coastal sediments and peat accumulations by establishing chronologies and accumulation rates through the measurement of atmospheric fallout of naturally produced 210Pb and artificially produced 137Cs and 241Am radionuclides. Tracing atmospherically deposited pollutants through terrestrial and lake ecosystems by comparing distributions of 210Pb and other pollutants, in particular trace metals. Monitoring radioactive discharges and emissions from nuclear and non-nuclear sites; assessing state and changes of gamma radiation does rates in the environment. For sediment analyses we require 0.5g dry mass of each sample as a minimum. Please send more sample mass if at all possible as this can reduce counting time for samples with low level radionuclide activity and also reduces counting errors derived from background. For core dating work, it is also a good idea to send as many samples as possible at the start. If during the analysis we find we need to request additional samples from you, this can considerably increase the time it takes to complete the work and to send you a report. Samples should be submitted dry. Freeze-drying or air-drying are both fine. For sediment and soil core samples dry density data are required for the core as these are used for calculating radionuclide inventories.If you do not have these data, sediment dry density may be calculated from the sample’s dry weight (or water content) and the wet density.Please do send us an e-mail if you have any questions about this. A document covering the Standard Operating Procedures for our laboratory is available upon request. Please send your samples to: Department of Geography, Pearson Building, University College London, Gower Street, London WC1E 6BT, UK. Please mark for the attention of either Dr Handong Yang or Prof. Neil Rose. The analysis is non-destructive and we are happy to return your samples, so do let us know if you want them sent back to you after the analysis is complete. Department of Geography, Pearson Building, University College London, Gower Street, London WC1E 6BT, UK.